1. 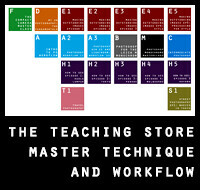 By popular demand…presenting Ming Thein’s Introduction to Photoshop Workflow DVD! My personal workflow – if you’ve ever wondered what my postprocessing process is, or how I get the style and look you see on the site and in my commercial work, this is for you. Several end to end processing examples – I’ve picked a number of files that I’d consider difficult or processing-intensive to use as step by step walkthroughs. The Camera Raw portion – where about half the work is done – also applies to Lightroom and Photoshop Elements, too. The buttons may be different, but the fundamental principles of tools don’t change between software – dodge is dodge, burn is burn, and curves are curves. Total runtime is about 1h 15min. This will be the first in a series of many DVDs in which I’ll spend more time detailing and explaining the various functions of Photoshop and their application to photographers, but it makes the ideal starting point for anybody who would like to get started in serious postprocessing, or perhaps are wondering why their images lack that punch and sparkle. Please note – for KL residents, happy to do MEPS – please send me an email to make arrangements. I’ve now cleared the pipeline somewhat, which means I can take on a fresh batch of students for my Email School of Photography – more details here. It’s a unique, fully-customized correspondence course tailored to your skill level and photographic objectives – learn what you want to learn, at your convenience. So for all of you who were on the fence, now’s the time to sign up. The course is just US$800 for ten sessions including a detailed portfolio review; once again payable via paypal to mingthein2(at)gmail.com. I truly and unfortunately have to say, that I’m very disappointed by this workflow tutorial. I’m a long term reader and admirer of your work and I thought I’d give one of your post-processing videos a try, because that’s where I have most of my difficulties in my whole process from taking to printing. If you start from scratch, I highly recommend this video, not only because it’s good structured and easy to understand, I really like your way of purism. But for me, actually I was afraid of this before – there was almost nothing new. Maybe the procedure on sharpening was interesting. But then, 60$ for a lesson of sharpening – a little much for me. If you’re a long time photographer and know the basics of PS and don’t like art-filters or anything in that corner, maybe go look on a more intermediate lesson. Like you could have imagined, also in photography everybody here puts his pants on the same way. You don’t have to point out that I don’t get the same results like you. I never claimed that. Well, maybe my feedback was a bit harsh, because I am disappointed. I mean, when it comes to your workflow, there is so much more to consider – like evry kind of background knowledge you have and apply. But also your reply sounds a little rude to me. Well, makes it easier for me to decide wether I will make a purchase in the future again or not. No, it’s the truth: you firstly misread the video description, which clearly stated INTRODUCTION. You yourself said “If you start from scratch, I highly recommend this video, not only because it’s good structured and easy to understand”. Thanks Toby. I honestly didn’t see anything extra in CS6 that would change the workflow, hence lack of an update…in the end I didn’t bother upgrading myself, either. I received your PS workflow dvd a few days ago and have enjoyed it very much. Though not familiar with Photoshop I look forward to trying out the many techniques you discussed and feel confident it will start me on the right path as I step into the often confusing world of post-processing. Btw. thank you for your brilliant site! Big compliment for your work! Is the app also available for android? or if not will it be any time soon? Not at the moment, but I’m looking into it. Need to get back the development costs for the first app! After receiving your DVD I installed Adobe Photoshop CS6, never having seen it, camera raw or bridge before. I would not have believed it possible, but thanks to your great instruction on your DVD, I worked my way through bridge, camera raw and successfully processed photos in Photoshop CS6 in just one day and i keep going back to your DVD to learn more. I can’t thank you enough. You mentioned in the DVD the importance of using a tablet for post-processing work. Could you recommend. a tablet which would work with my Mac PC and Mac version of Adobe PS CS6? And could you point me towards anything you may have written about using a tablet if you have done that? I use a Wacom Intuos4, which has since been replaced by the 5 – not much to say about the tablets other than a) they’re pressure and tilt sensitive, and b) map 1:1 to the proportions of your screen. Once you train your muscle memory, they’re a very fast way of working and give you fantastic control over your dodge and burn brushes. Hi Ming..I’m in Ipoh, how much would it cost in RM, postage inclusive, for the DVD to Ipoh Mali 🙂 Perhaps can do an IBG? Hi Ceasar, it’ll be RM170. I take MEPS/ online transfer – have sent you an email with the details. Thanks! Received the DVD with thanks. Just wonder at 0346 of the DVD, how can I get the Workflow Options appear ? Thanks for letting me know. Could you be a bit more specific please? OK at 0446 (instead of 0346) of the DVD there is a window pop out for “workflow options”. I just wonder how to get this window out so that I can select the color space, depth, size and etc. you may have been asked this already, but could you provide a downloadable file/zip instead of the physical DVD ? Sorry Gwen, it’s DVD only for now – the files are enormous as they’re both recorded at actual pixels and aimed at retaining as much of the original subtlety as possible. I really like the clean, uncluttered look of your images – not just IQ itself but concerning subject matter as well. It is a look I am very drawn too and appreciate. I think it must be is very hard to get just right but you do make it look easy. Along with many other articles, I have read the one you mentioned. That’s what I was referring to with the ‘b’ and ‘c’ comment :). I don’t know how you have the time to write so much on this site with everything else you do. It will keep me busy for a long time trying to delve into all the articles. I got your confirmation email and am looking forward to the DVD. PS – For those who want to support your work you should put a link to your Blurb books. Unless you already have and I just haven’t found it yet, which is likely as there is a lot to take in here and I haven’t scraped the surface I think. How did those turn out and are you planning on doing any more? Usual answer – not much sleep! As for Blurb, I don’t feel that they make sense commercially because they’re either affordable and too light to be taken seriously – simply not enough pages – or too expensive precisely because of the number of pages. And making $5 a book isn’t worth it because you’re simply not going to sell that many of them. I might do a very limited run in the future of a fixed theme, but not for now. Am an ardent fan of your website, and am interested in the Photoshop workflow DVD. Understand that this is purely a Photoshop workflow-oriented DVD, but wonder if the techniques used would equally be applicable for a LR-only workflow? Understand that the Camera Raw bit would be universal in both LR and PS though. Thanks! Thanks CK – yes, the ACR bit apples to all Adobe products that use it, but there are PS specific portions – dodge and burn, multiple curves etc that cannot be done with LR. There are workarounds, but they’re crude and do not allow for the same degree of control. Thanks for your support Kim, I’ve responded via email. The main things that are missing are full control over masks, dodge and burn brushes, layers, multiple curves and multi-pass sharpening. You don’t always need all of them, of course (and dodge and burn brushes are really the only critical ones). Hi Ken, the answer boils down to economics. Adobe charges $600 a pop for full fat PS because they can, and because if you use it for every single shot – as I do – the cost is amortised very quickly. I haven’t used elements in a while so I can’t say; but if it has layers, dodge and burn brushes and multiple curves, then yes. And the whole point of the DVD is to establish a workflow make the process as fast as possible – if I’m not having to do commercial grade retouching, I spend less than a minute on each image. Just wonder when can I receive the DVD I ordered. You send by post or DHL ? Thanks David, will confirm via email. Ah – good to know, thanks! Just to confirm. Should I send the money to this email mingthein2(at)gmail.com or should it be mingthein2@gmail.com? Replace the (at) with the @ symbol; I don’t post the email address openly to avoid spam bots – thanks. Hi Ming, I successfully transferred the money to your account mingthein2@gmail.com for the photoshop workflow DVD. I’m excited to get this copy. 🙂 may I know when I can get it so i will have an idea when should I’ll be looking for it in our internal mail in the office. Should take around two weeks – I’ll ship once I get back from Tokyo in a couple of days. Will send out a confirmation to your paypal address too. Thanks!